Moving north from Florence you climb up and up, past Fiesole to a ridge formed by Mounts Calavana and Giovi with views down into the valley of the Mugello. On the slopes of those hills, at the end of a steep, winding lane is the hamlet of Barbiana – not much more than a few houses and the church of Saint Andrew. It is a good place to put a priest who asks too many awkward questions, especially in 1954: no decent roads, electricity, telephone, mail. Barbiana became the punishment for Don Lorenzo Milani’s activism and where he stayed until a few days before his death in 1967. On Monday, I cycled there on a warm spring day, now all lush and green and calm and very different I imagine from how it is in winter, facing north and 1,500 feet up in those hills. Here Don Milani set about establishing his school – a particularly open school, running from 8 in the morning until 7.30 in the evening, 365 days a year, that would serve as a base for local children to learn and to help establish their right at being in the world: the walls of the “classroom” adorned with graphical representations of the outcomes of Italian elections, maps, an injunction written in large letters “I CARE”. Barbiana School, interior. The group tables and benches are key to the teaching methods, with Don Milani using group-work and goup-writing techniques adapted from Freinet via Mario Lodi. 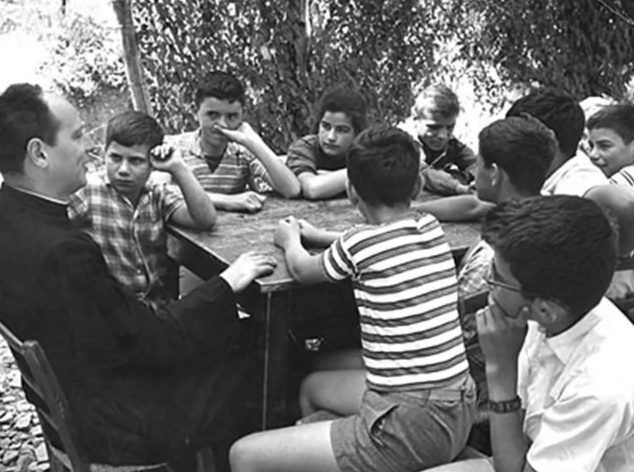 Though the church’s intention was to relegate Don Milani to the middle of nowhere, he turned Barbiana and its students outwards to the world and made sure the world came into the classroom – as the pictures suggest, politics and participation in democratic life were considered key. He continued to cause trouble, promoting conscientious objection to the military and attacking the education system, in particular its structural rejection of working class children through its tendency to fail them in their end of year exams and so force them to repeat year after year until they dropped out. This, the priest and students understood, was a failure of the state to deliver its constitutionally-enshrined guarantee (at the time) of eight years of schooling: “Eight years means eight different grades. Not four grades repeated twice each. Otherwise it would be a nasty play of words unworthy of the Constituent Assembly [who wrote the constitution after the war]” (p. 67, all page references are to the version cited at the end). There are masses of data in the book too – the students wrote to the national statistics authority and anybody else who might provide answers as to why poor, rural children were losing out. A key part of their argument was that the children of well-off families were learning at home (or through private lessons) the forms of knowledge that would come to be used in tests that all students had to sit in order to pass for the next year of schooling. For example, this chart  “Mestiere del Babbo” or “Father’s Occupation” shows that children of Contadini (farm workers) made up 34.9% of the school population but 78.9% of those who dropped out (pushed out, they would say) between the 5th year of primary school and the 1st year of lower secondary. The pattern continues with children of non-rural workers (Operai) as 30.5% of the school population but 15.8% of the leavers between primary and lower secondary, and so on. “Commer. e Artigiani” = Commerical and Skilled Workers; “Super” = Employees, professionals etc. The aggregate effect was a pyramid-shaped pattern of increasing social exclusivity in the education system as shown in this chart “Iscritti alle Scuole” (School Enrollments) where, starting from the bottom, each level of blocks upwards represents a completed year of achievement of the school system and each block along the x axis shows the numbers of students achieving that year (in thousands) for boys to the left of the centre of the pyramid, girls to the right. It’s an interesting book for all kinds of reasons: it makes a significant contribution, some say, to the events of 1968; it continues to form part of Italy’s cultural dialogue about education and what education is for; the possibility of making educational institutions more democratic; and its production – a book written by students together, coming from an idea that one of them had and based on research into their own lives. It also illustrates the role of Don Milani himself, a contradictory figures in some ways but also an example of care and guidance, showing what a small group of committed people can do to change a system geared towards divesting itself of the “weakest”. The chart appears on p. 35. The data were taken by the students and come from one town in the province of Florence for the school years 1963-4, 1964-5, 1965-6. All page numbers refer to the version of the book I have: Scuola di Barbiana. (2017) Lettera a una Professoressa. Milano: Mondadori. Previous Learning in inappropriate spaces?